► Does China’s J-20 rival other stealth fighters? Does China’s J-20 rival other stealth fighters? The Chengdu J-20 marks the first entry of a multirole stealth fighter into China's armed forces. 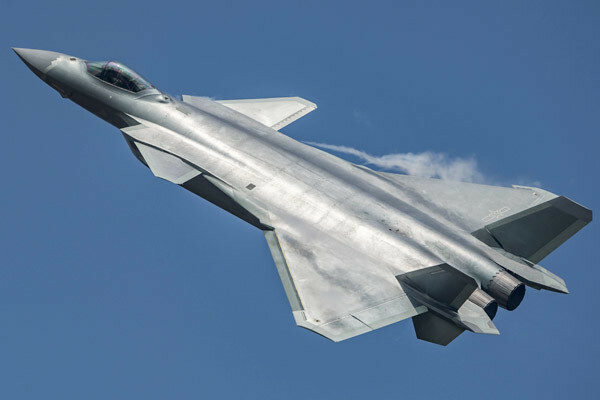 According to the Department of Defense (DOD), China views stealth technology as a core component in the transformation of its air force from "a predominantly territorial air force to one capable of conducting both offensive and defensive operations." Designed for enhanced stealth and maneuverability, the J-20 has the potential to provide China with a variety of previously unavailable air combat options and enhance its capability to project power. As an advanced multirole stealth fighter, it is speculated that the J-20 can fulfill both air-to-air and air-to-ground combat roles for the People's Liberation Army Air Force (PLAAF) and the aviation branch of the People's Liberation Army Navy (referred to as either Naval Aviation or the PLAN-AF). According to PLAAF Senior Colonel Shen Jinke, the J-20 will enhance the overall combat capability of China's air force. A 2016 report by the DOD states that the J-20 represents a critical step in China's efforts to develop "advanced aircraft to improve its regional power projection capabilities and to strengthen its ability to strike regional airbases and facilities." In 2014, the US-China Economic and Security Review Commission described the J-20 as "more advanced than any other fighter currently deployed by Asia Pacific countries." The J-20 is believed to be equipped with subsystems and field signature reduction technology that collectively meet the internationally-accepted classification of a "fifth-generation" aircraft. This refers to military aircraft featuring the general requirements of stealth technology, supersonic cruising speed, and highly integrated avionics. The J-20 is the first Chinese aircraft to fit this description, and it may serve as a critical asset for both the air force and the navy. As these branches have different areas of responsibility, how the J-20 is ultimately utilized is likely to vary. In broad terms, the PLAAF is China's mainstay for air operations and is responsible for homeland air defense, while Naval Aviation is tasked with fleet air defense and defending the territorial waters and coastline of China. 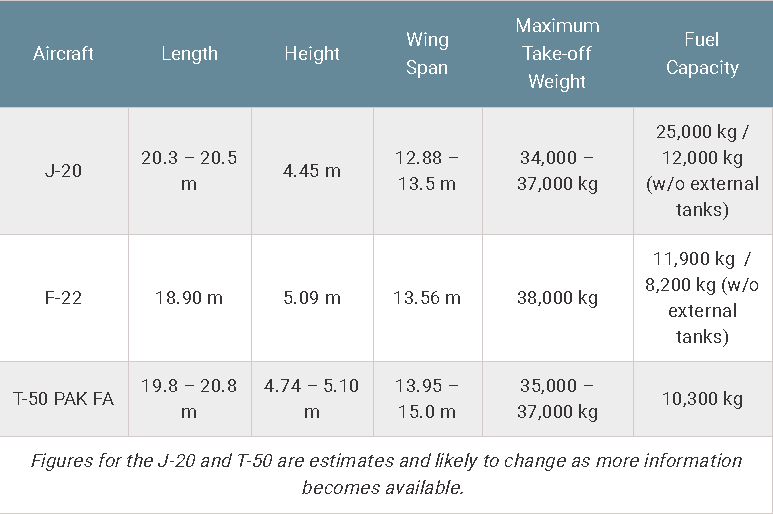 It is worth noting, however, that China's criteria for defining aircraft generations differs from accepted international standards. China defines aircraft generations based upon when an aircraft was integrated into the air force. Per China's criteria, the J-20 is considered a fourth-generation aircraft. Currently, the United States is the only country with a fully operational fifth-generation fighter. 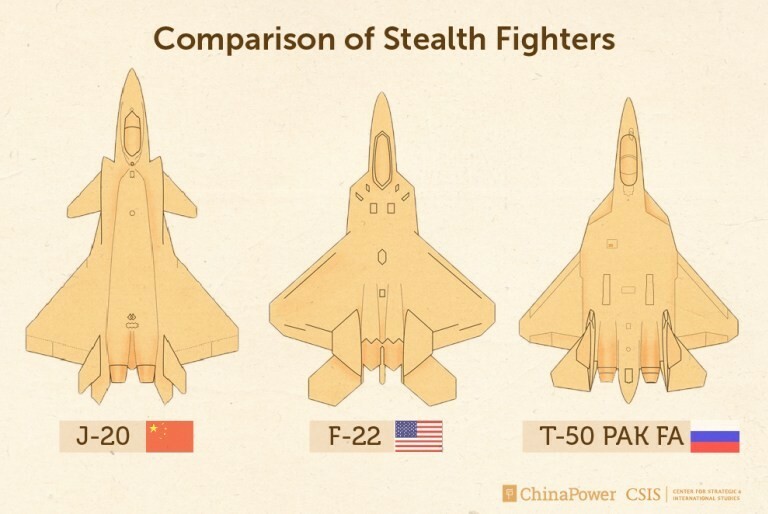 Several other countries including Russia, India, and Japan are currently in the process of developing their own advanced stealth fighters that fit this classification. The J-20 is one of two stealth fighters being simultaneously developed in China. The other aircraft is the Shenyang FC-31, a smaller multirole stealth fighter that is being developed by the Shenyang Aircraft Corporation and could potentially be commercially exported to other countries. The two Chinese stealth fighters may have been designed to complement each other in a similar manner to the planned deployment of the F-22 and F-35 by the United States. At present, China and the U.S. are the only two countries that have concurrent stealth fighter programs. According to General David L. Goldfein, Chief of Staff of the U.S. Air Force, information-age fighters like the J-20 are designed to link into national defense networks, which enables these cutting-edge fighters to access real-time information supplied by satellites and unmanned air vehicles (UAVs). As a result, the J-20, like the F-35, should be assessed as part of a "family of systems" instead of a standalone aircraft. On September 28, 2017, it was announced that the J-20 has been officially commissioned into service, but the aircraft is unlikely to be fully operational until 2018 or 2019. The J-20 is part of a small but elite group of advanced fighters either currently in service or under development, including the F-22 Raptor and the T-50 PAK-FA. Early reports over-estimated the J-20's length at approximately 23 meters (m), but satellite imagery has reliably shown the J-20 to be between 20.3 and 20.5 meters long - making it comparable in size to both its American and Russian counterparts. It has been reported that the J-20 is expected to feature a Maximum Takeoff Weight (MTOW) of 34,000 - 37,000 kilograms. By comparison, the F-22 has an MTOW of 38,000 kilograms, and the T-50 has an MTOW between 35,000 - 37,000 kilograms. Some analysts have suggested, however, that it is unlikely for the J-20 to have a lower MTOW than the F-22. Both aircraft are similar in size, and it is likely that the more rearward placement of the J-20's engines in its fuselage relative to F-22 offer the Chinese fighter a substantially greater internal volume. In terms of armaments, the J-20 contains two lateral bays for small air-to-air missiles and a larger bay under the fuselage for a variety of missiles and surface attack weapons. This is similar to the weapons bay configuration of the F-22, but different from the Russian T-50, which instead holds two small and two large weapons bays. The J-20 is also slated to carry a variety of advanced electronic systems. This technology includes an active electronically scanned array, a chin mounted infrared/electro-optic search and track sensor, and a passive electro-optical detection system that will provide 360° spherical coverage around the aircraft. These systems are expected to be comparable to those found inside the F-35. Additionally, the J-20 is likely to field an advanced communications suite that will enable it to datalink with friendly platforms in service and platforms under development, such as the Divine Eagle airborne early warning drone. Prototype and early production models of the J-20 were equipped with the Russian AL-31 engines, but China is developing a new, more powerful powerplant. Chen Xiangbao, an Aero Engine Corporation official, announced on March 13, 2017 that the J-20 will soon feature next-generation engines. Reports indicate that China plans to upgrade the J-20 in the coming years with the Chinese-made WS-15 engine, which would provide the J-20 with sustained supersonic travel (supercruise). This new engine may rival the cutting-edge Pratt & Whitney F119 engine currently used by the F-22. Compared to the older engines, the WS-15 would enable the J-20 to travel further while consuming less fuel and fly faster for longer periods of time. It is unknown when the WS-15 will be put online; in the interim, it has been reported that China has outfitted the newer models of the J-20 with the WS-10 engine. The domestically built WS-10 is less powerful than the WS-15, but advanced versions of the WS-10 are capable of achieving low supercruise. Other countries with advanced militaries, such as the U.S., Russia, and many European countries, all have fighter aircraft with supercruise capability. Using a Physical Optics simulation algorithm, co-founders of the Air Power Australia think-tank Dr. Michael Pelosi and Dr. Carlos Kopp determined that the J-20, like the F-22, has also achieved some Low Observable design goals for enhanced stealth. Such a design allows the J-20 to bypass radar and electronic countermeasures with low to zero visibility. However, some aspects of the aircraft, such as the round nozzle of earlier models (the WS-15 may have a stealthier design) may work against its stealth capabilities. The T-50 may share a similar rear aspect signature reduction, but it is worth noting that both aircraft likely boast superior signature reductions when compared to fourth generation fighters. China may be working to incrementally improve the J-20's stealth capabilities. Advanced versions of the WS-10 engine are reported to feature sawtooth serrations around its edges that are designed to redirect radar away from the nozzles. In contrast, the F-22's Pratt & Whitney F119 engines have square nozzles, which greatly improves stealth. Many details regarding the J-20 remain unknown. Based on observed serial numbers and the recent unveiling of two J-20's at the Zhuhai Air Show in November 2016, at least eleven J-20s may have already been produced. This number may suggest that the J-20 has now entered low-rate initial production (LRIP), the small-quantity testing phase prior to mass production. Experts differ on the J-20's flyaway cost - the marginal per-unit production cost, with estimates ranging from $30 million to up to $120 million. By comparison, the F-22 has a per-unit cost of $143 million while the T-50 is estimated to cost less than $100 million. Peter Singer notes that China is likely capable of mass-producing the J-20, but it remains unclear how many J-20s will be produced. Higher-end estimates indicate that several hundred J-20s will be produced to replace older fighters. The J-20 has the potential to considerably enhance China's regional military strength. According to a 2014 U.S. Naval War College report, an operational stealth fighter would "immediately become the most advanced aircraft deployed by any East Asian Power," surpassing the aircraft fielded in India, Japan, Australia, Indonesia, or Taiwan. The U.S.-China Economic and Security Review Commission advances a similar assessment, noting that the arrival of the J-20 will enhance China's military leverage against opposing forces in the region. With the J-20 expected become fully operational in the next couple of years, the PLAAF has a considerable head start over the Indian, Japanese, and Korean air forces, which are not slated to put their locally-made advanced fighter counterparts into service until the 2020s. Opinions vary about the J-20's comparative strengths as an air superiority (air-to-air) fighter or a strike (air-to-ground) aircraft. Some analysts believe that the J-20's emphasis on frontal stealth makes it an effective long-range interceptor, meant for mid-air engagements. Others see the J-20 as a long-range strike aircraft, best suited for penetrating enemy air defenses and damaging critical infrastructure on the ground. Such high-value targets would include airfields, command bases, and other military installations. A 2015 RAND report noted the J-20's "combination of forward stealth and long range could hold U.S. Navy surface assets at risk, and that a long-range maritime strike capability may be a cause for greater concern than a short-range air-superiority fighter like the F-22." The J-20's size and weapons configuration may, however, preclude it from functioning as an effective strike fighter in either context. Importantly, the mission types Chinese pilots are trained for may determine how the J-20 is eventually utilized. Reports differ regarding the J-20's range, which is expected to fall between 1,200 and 2,700 kilometers. Regardless of this uncertainty, the J-20's combat radius is likely to extend well-beyond the Chinese mainland. The U.S. Naval War College suggests that the J-20 could be an "effective surface-attack platform for out to several hundred nautical miles at sea." Air Power Australia notes that the J-20 would be a suitable choice of aircraft for operating within China's "first island chain" and "second island chain." Should China integrate aerial refueling aircraft with the J-20, the stealth fighter's operational range would extend even further across the Asia-Pacific. Increased range offers China considerable flexibility in terms of basing options. Basing the J-20 further inland means the J-20 can conduct distant missions before returning to the relative safety of China's Integrated Air Defense System. This modernized aerial defense net - composed of early warning sensors, long-range surface-to-air missiles, and air interceptors - may deter opposing air forces from pursuing J-20s into the mainland. China will continue to improve and upgrade its cutting-edge J-20 stealth fighter jet, giving it more capabilities than merely penetrating an enemy's air defense networks, according to its chief designer. Yang Wei, a deputy director of science and technology at Aviation Industry Corp of China and an academician of the Chinese Academy of Sciences, told China Daily in an exclusive interview that designers will develop variants of the radar-evading J-20 and will open research on its successor－a sixth-generation fighter jet. "We are not complacent about what we have achieved. We will develop the J-20 into a large family and keep strengthening its information-processing and intelligent capacities. At the same time, we will think about our next-generation combat plane to meet the nation's future requirements," Yang said. The designer made the remarks on the sidelines of the ongoing first session of the 13th National People's Congress in Beijing. He is a deputy in the nation's top legislature. "In the past, we had to follow others' paths when it came to designing military aircraft because our research and development capabilities were primitive in this regard, but now we have become capable of designing and making what we want to have," he said. The senior designer said that the J-20 is the best fighter jet in China, so it would be used at the most crucial moments during a war. "Of course, it will be tasked with penetrating air defense networks, but that will not be its only mission. It definitely has multiple functions. How we will use it depends on its production and deployment scale," Yang said. The J-20, China's first fifth-generation combat aircraft, made its maiden flight in January 2011 and was declassified in November 2016. It was the third such stealth fighter jet to enter service, after the United States' F-22 Raptor and F-35 Lightning II. It has been sent to take part in a series of combat exercises with other advanced fighter jets in the Air Force and practiced beyond-visual-range aerial fighting maneuvers during the drills, according to the Air Force. The jet shoulders the important responsibility of making way for other aircraft in an air battle, said Zhang Hao, head of an Air Force flight-testing center that has deployed the jet. In addition to the J-20, AVIC is testing the FC-31, another fifth-generation combat plane, and wants to use it to tap the international market for advanced fighter jets. The Air Force has made clear that it will not allow exports of the J-20.